Michaelangelo is out walking during the Christmas holiday, enjoying the sights and atmosphere. On his travels he finds a stray cat that he picks up and names Klunk. Mike decides to do some last minute shopping and heads downtown, which is all a bustle with fellow shoppers. The thinly yet effectively disguised Ninja goes into a toy shop and finds numerous items to amuse himself with – much to Klunk’s dismay. The cat is frightened by the Turtle’s hijinks and runs off into the alley. Mike goes to find his newfound companion when he discovers some robbers hijacking a truck in the alleyway. The vehicle is full of “Little Orphan Alien” dolls (the “hot” item of the year) which are intended to be donated to an orphanage. The crooks don’t care about the philanthropic goal that the dolls are meant for, and they knock the driver unconscious and steal the truck, dolls and all. Klunk cries out and the burglars hear him. The bad dudes spot Mikey and open fire on him with their handguns. Mike isn’t impressed and rushes the hoodlums, who freak and flee in the truck. Mikey manages to hop inside the back of the vehicle as it speeds away. 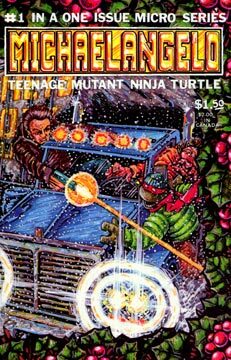 The Ninja Turtle manages to get the better of the thieves and decides to drive the truck to the orphanage himself. Unfortunately for the well meaning Ninja, the police are looking for the vehicle and when they spot it, a chase ensues. Mikey manages to elude the police, but not before he causes some destruction of public property… alas, things don’t always go as smoothly as we’d like. Once he’s escaped the long arm of the law, Mike parks the truck in a hidden alley, picks up Klunk and laments the fate of the toys – now they’re sure to be impounded as evidence, so the orphans won’t receive them in time for Christmas. Mikey hatches a plan and heads for home. Mike enlists the aid of his brothers and April, who take the van to the alley and fill it with the Little Orphan Alien dolls. On the final page we see the Turtles and April, in Holiday costumes, distributing the toys to the orphans. Ho ho ho! 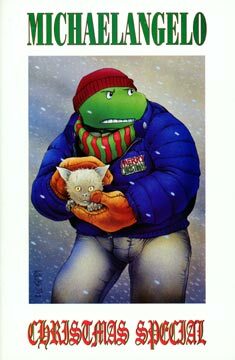 Additional Material: “A Christmas Carol” 13 page TMNT story by Jim Lawson.